The recent deadly tornado in Joplin, Mo., as well as a pair of devastating twisters in Springfield, Mass., serve as reminders to homeowners and renters nationwide about the need to shore up their properties – and their finances – against natural disasters. And since hurricane season officially kicked off June 1, Americans everywhere would be wise to safeguard their homes, businesses and valuables. Insurance experts say it's vital that homeowners review their homeowner's insurance policies annually and make sure their coverage is sufficient to completely replace, rebuild or repair their homes in the event of a catastrophe. Unfortunately, says Joe Brennan, president and owner of Insurance Claims Group Inc. in Cary, N.C., "most people are vastly under-insured." To ensure that you're properly covered, don't rely on estimates or suggestions from your insurance agent or realtor. Instead, Brennan recommends that you get a local home contractor to come out and provide a detailed analysis of how much it would cost to rebuild your residence if it were to be completely wiped out. Because most homeowner's insurance policies are so-called "replacement cost" policies, their value is based on the cost required to rebuild your home from the ground up in its current condition. Local contractors or builders are in a position to know rebuilding information, since they're familiar with labor costs, construction materials and the prices of various home finishes, such as ceramic tile vs. carpet or Corian countertops compared with Granite countertops. As an alternative to dealing with a contractor, you can pay $7.95 and use an online tool offered by AccuCoverage, suggests Chris Amrhein, head of Amrhein and Associates insurance agency in Lorton, Va.
An AccuCoverage report will calculate the replacement cost of your house based on such factors as your home style, its features and the materials used in it. "This is the same type of tool that many insurance professionals use," Amrhein says. A tornado is considered by insurers to be a "wind event" and is generally covered under most homeowner's insurance policies. However, other disasters – such as earthquakes, floods, landslides and natural fires – are generally not covered by homeowners insurance. To get protection against these disasters, you must buy separate catastrophic insurance coverage. For instance, the federal government underwrites flood insurance. The maximum coverage amount you can get is $250,000, and prices vary from about $350 annually in low-risk areas to more than $2,600 a year in high-risk zones. Even though the cost of insurance can really add up, not being insured can be financially devastating. 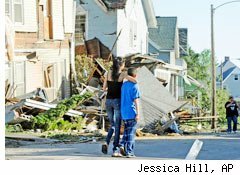 An Associated Press analysis of the states hardest hit by tornadoes in early 2011 showed that homeowners in these regions often ranked as those with the least amount of insurance. Consequently, homeowners who lost everything will face a tough road rebuilding and will undoubtedly struggle to get compensated by insurers or the government for their losses. Another important way to prepare for a disaster is to photograph or videotape the contents of your home or apartment, especially any expensive items you own. Don't forget to make a record of what's in your garage or outdoor shed as well. Having documented proof of your household items can make things easier when you're dealing with your insurance company – and that goes for people with homeowner's insurance as well as those with renter's insurance. Additionally, photographic records can help for tax purposes, aiding you in proving the market value of items for casualty loss claims. Check out IRS Publication 584, a disaster loss workbook, which can help you create a room-by-room list of your belongings. Also read IRS Publication 547 to learn about the tax rules for casualties and disasters. Knowing where your key financial documents are located is a smart idea any time. But in an emergency situation – where you may have only 10 or 15 minutes notice before you have to evacuate or take cover due to a natural disaster – it's even more critical to be able to easily put your hands on important paperwork. Obviously, if a hurricane, tornado or fire were approaching, it would be foolish to go running through the house trying to round up documents. But that doesn't mean you can't have speedy access to all your crucial paperwork in an emergency. One way to do so is to use a well-organized, personal document storage solution. For instance, LifeInCase is a durable, portable file system that helps consumers easily sort and organize important documents, financial data or other pertinent papers -- all in one simple, grab-and-go unit. The LifeInCase unit lets you put your documents into a compact, five-part system that includes sections for personal, medical, property, estate and financial papers. Each section contains a sturdy file folder and a handy checklist of suggested documents to store. "We like to say – 'Just in case, LifeinCase,' " says co-inventor Mark Gibson. In addition to any physical records and photos you may store in your home, the IRS also recommends that you keep a set of backup records in a safe place – away from the original set. Maintaining a backup set of records – such as bank statements, tax returns and your insurance policies – can be done easily online. Simply scan photos and paper documents to create electronic copies. Many financial institutions provide statements and documents electronically. Plus, you can use third-party services to securely store sensitive data away from your home. Doing so means all your important paperwork and photos won't be lost in the event a catastrophe hits your residence. "Transfer all important physical documents...such as wills, stock certificates, bonds, etc., to a safe and secure place such as a locked box or an online secure vault," says Steve Schwartz, executive vice president of consumer services for Intersections Inc., a provider of consumer and corporate identity risk management services. Having key documents in electronic form will also let you later print those documents, download them to a backup storage device, like an external hard drive, or burn them to a CD or DVD. We all hope and pray that we can escape or survive natural disasters. But clearly, that's not always possible. It's tough enough to deal with the heart-wrenching loss of life and the massive personal injuries often caused by tornadoes, hurricanes and other catastrophes. But by taking a few precautionary measures upfront – and planning for a worst-case scenario – you can at least be better prepared financially if a natural disaster strikes you and your loved ones.